During the Gallo-Roman era, Jumilhac was an agricultural estate belonging to a certain Gemilius (Gemili Actum). In the 5th century (472), the Visigoths, winning the North of Aquitaine, seized the fortified village named Gemiliaco. In 508, the Franks rebuilt a stronghold that will be plundered and destroyed by the Vikings in 846. Three centuries later, in 1152, Jumiliaco is built again and becomes a stronghold coveted during the first Anglo-French conflict by Richard Lionheart. Philippe Auguste, the french king, at the beginning of the 13th century, picks up and destroys the castle. 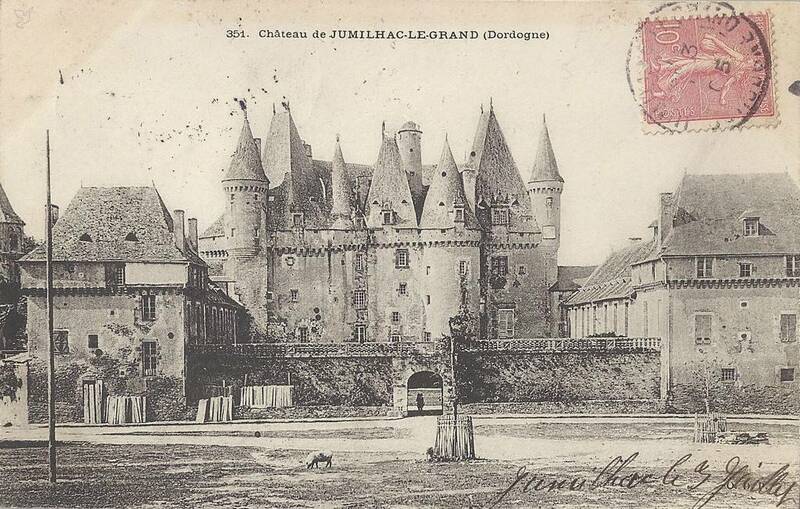 During the same century, in 1258, a text mentions that the lordship of Jumilhac is in the hands of three families: the La porte, the Bruchard and the Tessières (the latter family ‘ disappearing’ in the 14th century). The first two go there have a den. During the Hundred years war, du Guesclin besieged the fortresse and beat the English troops of the Black Prince in 1370. In 1579, Antoine Chapelle, married Marguerite de Vars, heiress of half the domain of Jumilhac. Then, in June 1581, he bought the second part of the domain. He paid tribute to his Overlord, the County of Périgord, Henri de Bourbon (Henri III of Navarre). Latter, become King of France under the name of Henri IV, in gratitude for the financial assistance provided during the troubles of the League, the king amounted Antoine Chapelle to the rank of count of Jumilhac (1597). 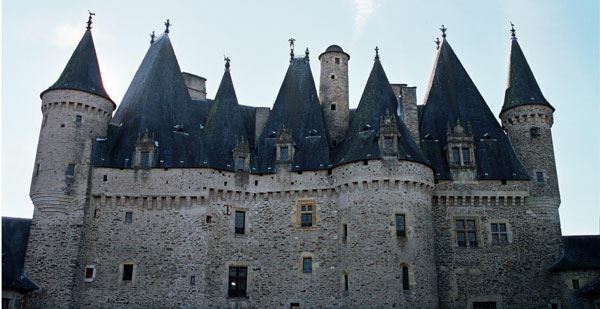 To mark this new status, Antoine Chapelle enlarged the castle into a residence Renaissance. After 20 years of change, he added the roofs decorated with allegorical Ridge (stately and alchemical). The grandson of Antoine, François, raised to the rank of Marquis (1655) for his military achievements, began to restructure the castle in the style of the 17th century. He transformed the defense towers and the wall linking them in housing wings and curtain wall of honour. He transformed the pre-existing dependencies in wings after creating the 1st floor. 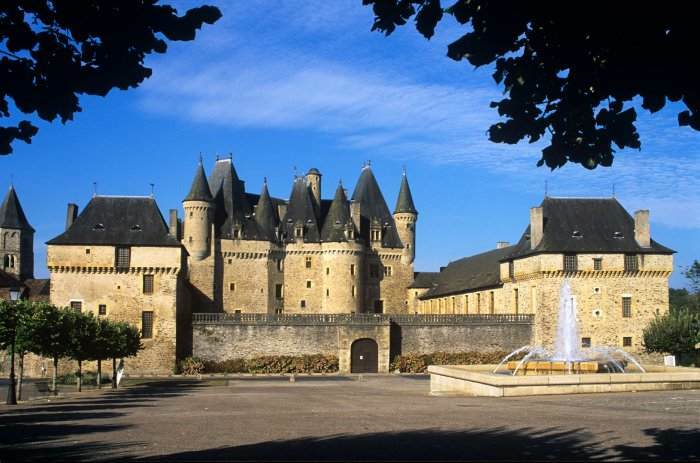 During the French Revolution, the Castle had been seized as “far away property” after emigration in England of Antoine-Pierre, son of the Marquis of the time. The installation within the castle of the municipality and the company of people saved the castle from destruction. At the beginning of the nineteenth century, Antoine-Pierre, became Marquis of Jumilhac, focused on sheep farming and agriculture. In 1808, his farm burnt and, he resumed his service in the army under the leadership of Napoleon I. Married to the sister of the Duke de Richelieu, he became the heir apparent of the Duke in 1811. 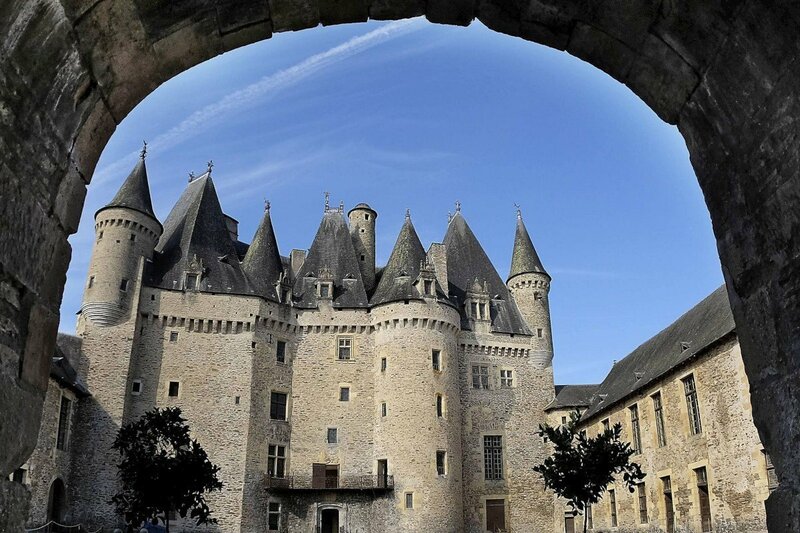 This is why he sold all his properties in Périgord, drawing out the castle of the family for more than a century. 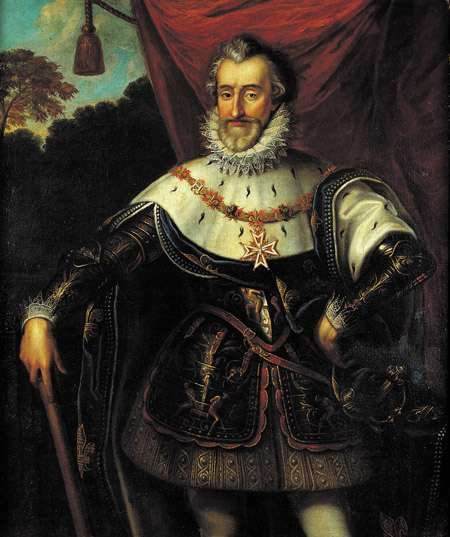 At the moment of the death of the dukede Richelieu, it is the son of Antoine-Pierre who inherited the title: Duke of Richelieu and of Fronsac, Pair de France. The property was sold to family Etienne, major sugar manufacturers of Nantes, in 1858 and will pass by marriage to the family Say (now sugar Begin-Say). Heavily indebted by the desire to develop the trading post of Port Say to the Moroccan-Algerian border, Jean-Baptiste Say separates gradually before the 2nd World War of some 1,400 h of land still attached to the Castle, furniture and finally puts the castle for sale in 1915, finding as purchaser in 1917 as a dealer that will benefit before selling it to turn in 1919 in two Jumilhacois that will try to Save the State of neglect in which he found himself. Three families lived individually wings and the old castle to the point of raising a wall in the cour d’honneur; the arcades of the curtain wall housed shops of the villages, the entrance of the Castle housed the station’s small chemin-de-fer, sort of tortillard which connected St Yrieix in Haute-Vienne in Thiviers, home room was the merchant of cycles and shop was the merchant of wine and spirits! 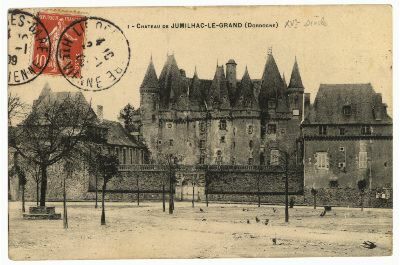 In 1927, Odet de Jumilhac and his wife Mathilde de Dreux-Brézé bought the family Castle. After several years of restoration, the Castle had been open to the visit in 1964. Today, it is Henry de la Tour-Du-Pin, their grandson, who is the depositary of the castle and who continues the work of his family.